I love his open, relaxed pose and expression in this photo. Lovely! What a lovely, warm picture. I wonder how old Lew was here? He looks quite a bit older than the Pros, but that might just be my impression. Oh wow! The real deal....I love this image, thanks a lot. 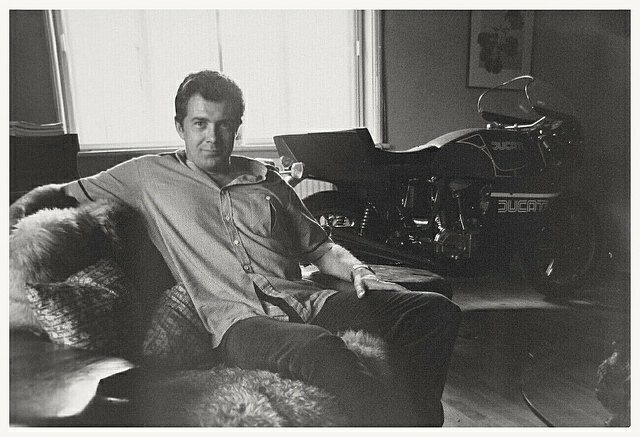 What a lovely, gentle picture of him - he looks so at peace and content, as well as trying to convey it's perfectly normal to have a ruddy great motorbike in the living room. It's so LC in every way - thank you for posting. Furry chair!! What a nice pic, thank you! ...furry bed, a little of Bodie gets everywhere. I'm such an inveterate picture straightener that with LC in the foreground I'm dawn by the wonky picture in the background.